Digital Air Strike™ is proud to employ and support our veterans and is thanking them for their service by sponsoring the Send-A-Vet program. 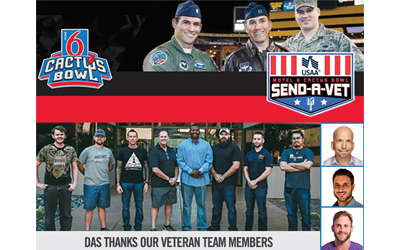 We are sending more than two dozen local veterans to the Cactus Bowl in Arizona on December 27th and are giving our clients nationwide the opportunity to nominate a veteran who works at their dealership for a chance to attend the game. Simply nominate your star veteran by posting their photo at your dealership to our Facebook page with a brief story about their service and how they inspire you. We will be selecting the nomination with the most likes, comments and shares so please encourage your staff to “vote” for your veteran on our Facebook page once you nominate them and to share the posts to their timelines. Besides tickets to the Cactus Bowl on December 27th, the winner will also receive R/T airfare for two to Phoenix, plus two-nights hotel accommodations*. The contest closes on November 18th so nominate your veteran and start voting today!Thank you for helping us recognize these national heroes on this special day. Thank you for helping us recognize these national heroes on this special day!